I know that people with dry skin long for the dewy look a lot of the time, which can be achieved with satin foundation. There is also looks that want to look mat bit just the cheeks look dewy. Or how about highlighting the higher points on your face without having to do so much blending. 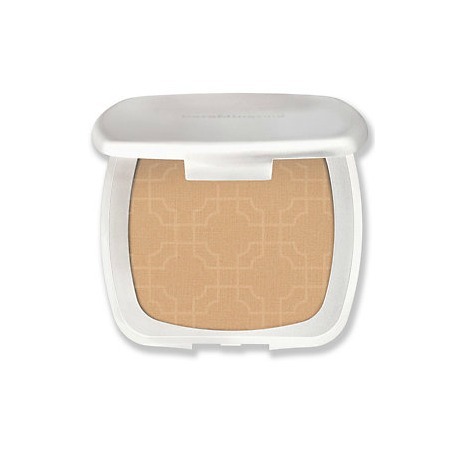 This product is a press powder luminizer. The one that I own in in 'The Shining Moment' which has a yellow undertone and looks gold. Bare Minerals do have another one in a peachy colour. This is a great product for day and night looks and really achieves a beautiful and healthy glow. Just a sweep along the cheeks, down the bridge of the nose and on the forehead (and maybe a bit on the cheek) brings you one step closer to a beautifully contoured face. Cheek bones will be more prominent, the forehead will appear smaller and the nose will appear slimmer. It is very easy to use, totally inexpensive and a definite must have for those days when you are trying to get ready in a rush. A little goes a long way with it. The shimmer levels are perfect. And it is build-able, so if you want more just apply more. It is important to understand the difference between a highlighter and a luminizer. This is not a product you want to be putting under your eyes (but it is a beautiful eye shadow . It needs to be used very lightly to achieve a dewy effect to the skin. It looks really great it a night club.There are down falls. Using too much can make the face appear cakey and unnatural. It also isn't the best product to use on liquid foundation. I do feel that it looks better with evening and late night looks rather than day. It is a Bare Minerals product so try and use it with their foundation also. Apply the product where you have good lighting. If you apply it in a darker room, you won't see it how others see it when your outside, so remember that a little goes a long way. If you do that correctly than you will have no problems. Play with it a little bit and see what works for you. I personally love to use it on my tear-duct aswell. To Buy? If you feel you need it, why not. Its a nice luxury to have. Click below to watch my video review of this product.